Leadership can be defined as a process by which one individual influences others toward the attainment of group or organizational goals. Three points about the definition of leadership should be emphasized. First, leadership is a social influence process. Leadership cannot exist without a leader and one or more followers. Second, leadership elicits voluntary action on the part of followers. The voluntary nature of compliance separates leadership from other types of influence based on formal authority. Finally, leadership results in followers' behavior that is purposeful and goal-directed in some sort of organized setting. Many, although not all, studies of leadership focus on the nature of leadership in the workplace. Leadership is probably the most frequently studied topic in the organizational sciences. Thousands of leadership studies have been published and thousands of pages on leadership have been written in academic books and journals, business-oriented publications, and general-interest publications. Despite this, the precise nature of leadership and its relationship to key criterion variables such as subordinate satisfaction, commitment, and performance is still uncertain, to the point where Fred Luthans, in his book Organizational Behavior (2005), said that "it [leadership] does remain pretty much of a 'black box' or unexplainable concept." Leadership should be distinguished from management. Management involves planning, organizing, staffing, directing, and controlling, and a manager is someone who performs these functions. A manager has formal authority by virtue of his or her position or office. Leadership, by contrast, primarily deals with influence. A manager may or may not be an effective leader. A leader's ability to influence others may be based on a variety of factors other than his or her formal authority or position. In the sections that follow, the development of leadership studies and theories over time is briefly traced. Table 1 provides a summary of the major theoretical approaches. Trait Theories 1930s Individual characteristics of leaders are different than those of nonleaders. Behavioral Theories 1940s and 1950s The behaviors of effective leaders are different than the behaviors of ineffective leaders. Two major classes of leader behavior are task-oriented behavior and relationship-oriented behavior. Contingency Theories 1960s and 1970s Factors unique to each situation determine whether specific leader characteristics and behaviors will be effective. Leader-Member Exchange 1970s Leaders from high-quality relationships with some subordinates but not others. The quality of leader-subordinates relationship affects numerous workplace outcomes. Charismatic Leadership 1970s and 1980s Effective leaders inspire subordinates to commit themselves to goals by communicating a vision, displaying charismatic behavior, and setting a powerful personal example. Substitutes foe Leadership 1970s Characteristics of the organization, task, and subordinates may substitute for or negate the effects of leadership behaviors. Three main theoretical frameworks have dominated leadership research at different points in time. These included the trait approach (1930s and 1940s), the behavioral approach (1940s and 1950s), and the contingency or situational approach (1960s and 1970s). The scientific study of leadership began with a focus on the traits of effective leaders. The basic premise behind trait theory was that effective leaders are born, not made, thus the name sometimes applied to early versions of this idea, the "great man" theory. Many leadership studies based on this theoretical framework were conducted in the 1930s, 1940s, and 1950s. Leader trait research examined the physical, mental, and social characteristics of individuals. In general, these studies simply looked for significant associations between individual traits and measures of leadership effectiveness. Physical traits such as height, mental traits such as intelligence, and social traits such as personality attributes were all subjects of empirical research. The initial conclusion from studies of leader traits was that there were no universal traits that consistently separated effective leaders from other individuals. In an important review of the leadership literature published in 1948, Ralph Stogdill concluded that the existing research had not demonstrated the utility of the trait approach. Several problems with early trait research might explain the perceived lack of significant findings. First, measurement theory at the time was not highly sophisticated. Little was known about the psychometric properties of the measures used to operationalize traits. As a result, different studies were likely to use different measures to assess the same construct, which made it very difficult to replicate findings. In addition, many of the trait studies relied on samples of teenagers or lower-level managers. Early trait research was largely atheoretical, offering no explanations for the proposed relationship between individual characteristics and leadership. Finally, early trait research did not consider the impact of situational variables that might moderate the relationship between leader traits and measures of leader effectiveness. As a result of the lack of consistent findings linking individual traits to leadership effectiveness, empirical studies of leader traits were largely abandoned in the 1950s. Partially as a result of the disenchantment with the trait approach to leadership that occurred by the beginning of the 1950s, the focus of leadership research shifted away from leader traits to leader behaviors. The premise of this stream of research was that the behaviors exhibited by leaders are more important than their physical, mental, or emotional traits. The two most famous behavioral leadership studies took place at Ohio State University and the University of Michigan in the late 1940s and 1950s. These studies sparked hundreds of other leadership studies and are still widely cited. The Ohio State studies utilized the Leader Behavior Description Questionnaire (LBDQ), administering it to samples of individuals in the military, manufacturing companies, college administrators, and student leaders. Answers to the questionnaire were factor-analyzed to determine if common leader behaviors emerged across samples. The conclusion was that there were two distinct aspects of leadership that describe how leaders carry out their role. Two factors, termed consideration and initiating structure, consistently appeared. Initiating structure, sometimes called task-oriented behavior, involves planning, organizing, and coordinating the work of subordinates. Consideration involves showing concern for subordinates, being supportive, recognizing subordinates' accomplishments, and providing for subordinates' welfare. The Michigan leadership studies took place at about the same time as those at Ohio State. Under the general direction of Rensis Likert, the focus of the Michigan studies was to determine the principles and methods of leadership that led to productivity and job satisfaction. The studies resulted in two general leadership behaviors or orientations: an employee orientation and a production orientation. Leaders with an employee orientation showed genuine concern for interpersonal relations. Those with a production orientation focused on the task or technical aspects of the job. The conclusion of the Michigan studies was that an employee orientation and general instead of close supervision yielded better results. Likert eventually developed four "systems" of management based on these studies; he advocated System 4 (the participative-group system, which was the most participatory set of leader behaviors) as resulting in the most positive outcomes. One concept based largely on the behavioral approach to leadership effectiveness was the Managerial (or Leadership) Grid, developed by Robert Blake and Jane Mouton. The grid combines "concern for production" with "concern for people" and presents five alternative behavioral styles of leadership. An individual who emphasized neither production was practicing "impoverished management" according to the grid. If a person emphasized concern for people and placed little emphasis on production, he was terms a "country-club" manager. Conversely, a person who emphasized a concern for production but paid little attention to the concerns of subordinates was a "task" manager. A person who tried to balance concern for production and concern for people was termed a "middle-of-the-road" manager. Finally, an individual who was able to simultaneously exhibit a high concern for production and a high concern for people was practicing "team management." According to the prescriptions of the grid, team management was the best leadership approach. The Managerial Grid became a major consulting tool and was the basis for a considerable amount of leadership training in the corporate world. The assumption of the leader behavior approach was that there were certain behaviors that would be universally effective for leaders. Unfortunately, empirical research has not demonstrated consistent relationships between task-oriented or person-oriented leader behaviors and leader effectiveness. Like trait research, leader behavior research did not consider situational influences that might moderate the relationship between leader behaviors and leader effectiveness. Contingency or situational theories of leadership propose that the organizational or work group context affects the extent to which given leader traits and behaviors will be effective. Contingency theories gained prominence in the late 1960s and 1970s. Four of the more well-known contingency theories are Fiedler's contingency theory, path-goal theory, the Vroom-Yetton-Jago decision-making model of leadership, and the situational leadership theory. Each of these approaches to leadership is briefly described in the paragraphs that follow. Introduced in 1967, Fiedler's contingency theory was the first to specify how situational factors interact with leader traits and behavior to influence leadership effectiveness. The theory suggests that the "favorability" of the situation determines the effectiveness of task- and person-oriented leader behavior. Favorability is determined by (1) the respect and trust that followers have for the leader; (2) the extent to which subordinates' responsibilities can be structured and performance measured; and (3) the control the leader has over subordinates' rewards. The situation is most favorable when followers respect and trust the leader, the task is highly structured, and the leader has control over rewards and punishments. Fiedler's research indicated that task-oriented leaders were more effective when the situation was either highly favorable or highly unfavorable, but that person-oriented leaders were more effective in the moderately favorable or unfavorable situations. The theory did not necessarily propose that leaders could adapt their leadership styles to different situations, but that leaders with different leadership styles would be more effective when placed in situations that matched their preferred style. Fiedler's contingency theory has been criticized on both conceptual and methodological grounds. However, empirical research has supported many of the specific propositions of the theory, and it remains an important contribution to the understanding of leadership effectiveness. Path-goal theory was first presented in a 1971 Administrative Science Quarterly article by Robert House. Path-goal theory proposes that subordinates' characteristics and characteristics of the work environment determine which leader behaviors will be more effective. Key characteristics of subordinates identified by the theory are locus of control, work experience, ability, and the need for affiliation. Important environmental characteristics named by the theory are the nature of the task, the formal authority system, and the nature of the work group. The theory includes four different leader behaviors, which include directive leadership, supportive leadership, participative leadership, and achievement-oriented leadership. According to the theory, leader behavior should reduce barriers to subordinates' goal attainment, strengthen subordinates' expectancies that improved performance will lead to valued rewards, and provide coaching to make the path to payoffs easier for subordinates. Path-goal theory suggests that the leader behavior that will accomplish these tasks depends upon the subordinate and environmental contingency factors. Path-goal theory has been criticized because it does not consider interactions among the contingency factors and also because of the complexity of its underlying theoretical model, expectancy theory. Empirical research has provided some support for the theory's propositions, primarily as they relate to directive and supportive leader behaviors. The Vroom-Yetton-Jago decision-making model was introduced by Victor Vroom and Phillip Yetton in 1973 and revised by Vroom and Jago in 1988. The theory focuses primarily on the degree of subordinate participation that is appropriate in different situations. Thus, it emphasizes the decision-making style of the leader. There are five types of leader decision-making styles, which are labeled AI, AII, CI, CII, and G. These styles range from strongly autocratic (AI), to strongly democratic (G). According to the theory, the appropriate style is determined by answers to up to eight diagnostic questions, which relate to such contingency factors as the importance of decision quality, the structure of the problem, whether subordinates have enough information to make a quality decision, and the importance of subordinate commitment to the decision. The Vroom-Yetton-Jago model has been criticized for its complexity, for its assumption that the decision makers' goals are consistent with organizational goals, and for ignoring the skills needed to arrive at group decisions to difficult problems. Empirical research has supported some of the prescriptions of the theory. The situational leadership theory was initially introduced in 1969 and revised in 1977 by Hersey and Blanchard. The theory suggests that the key contingency factor affecting leaders' choice of leadership style is the task-related maturity of the subordinates. Subordinate maturity is defined in terms of the ability of subordinates to accept responsibility for their own task-related behavior. The theory classifies leader behaviors into the two broad classes of task-oriented and relationship-oriented behaviors. The major proposition of situational leadership theory is that the effectiveness of task and relationship-oriented leadership depends upon the maturity of a leader's subordinates. Situational leadership theory has been criticized on both theoretical and methodological grounds. However, it remains one of the better-known contingency theories of leadership and offers important insights into the interaction between subordinate ability and leadership style. Although trait, behavioral, and contingency approaches have each contributed to the understanding of leadership, none of the approaches have provided a completely satisfactory explanation of leadership and leadership effectiveness. Since the 1970s, several alternative theoretical frameworks for the study of leadership have been advanced. Among the more important of these are leader-member exchange theory, transformational leadership theory, the substitutes for leadership approach, and the philosophy of servant leadership. Leader-member exchange (LMX) theory was initially called the vertical dyad linkage theory. The theory was introduced by George Graen and various colleagues in the 1970s and has been revised and refined in the years since. LMX theory emphasizes the dyadic (i.e., one-on-one) relationships between leaders and individual subordinates, instead of the traits or behaviors of leaders or situational characteristics. According to LMX theory, leaders do not treat all subordinates in the same manner, but establish close relationships with some (the in-group) while remaining aloof from others (the out-group). Those in the in-group enjoy relationships with the leader that is marked by trust and mutual respect. They tend to be involved in important activities and decisions. Conversely, those in the out-group are excluded from important activities and decisions. LMX theory suggests that high-quality relationships between a leader-subordinate dyad will lead to positive outcomes such as better performance, lower turnover, job satisfaction, and organizational commitment. Empirical research supports many of the proposed relationships (Steers et al., 1996). Beginning in the 1970s, a number of leadership theories emerged that focused on the importance of a leader's charisma to leadership effectiveness. Included within this class of theories are House's theory of charismatic leadership, Bass's transformational leadership theory, and Conger and Kanungo's charismatic leadership theory. These theories have much in common. They all focus on attempting to explain how leaders can accomplish extraordinary things against the odds, such as turning around a failing company, founding a successful company, or achieving great military success against incredible odds. The theories also emphasize the importance of leaders' inspiring subordinates' admiration, dedication, and unquestioned loyalty through articulating a clear and compelling vision. Tranformational leadership theory differentiates between the transactional and the transformational leader. Transactional leadership focuses on role and task requirements and utilizes rewards contingent on performance. By contrast, transformational leadership focuses on developing mutual trust, fostering the leadership abilities of others, and setting goals that go beyond the short-term needs of the work group. Bass's transformational leadership theory identifies four aspects of effective leadership, which include charisma, inspiration, intellectual stimulation, and consideration. A leader who exhibits these qualities will inspire subordinates to be high achievers and put the long-term interest of the organization ahead of their own short-term interest, according to the theory. Empirical research has supported many of the theory's propositions. 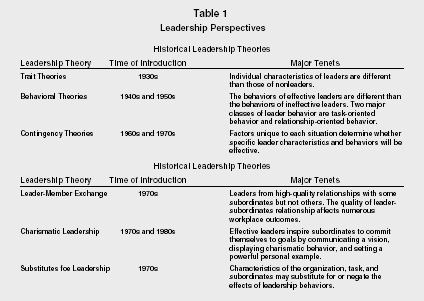 Kerr and Jermier introduced the substitutes for leadership theory in 1978. The theory's focus is concerned with providing an explanation for the lack of stronger empirical support for a relationship between leader traits or leader behaviors and subordinates' satisfaction and performance. The substitutes for leadership theory suggests that characteristics of the organization, the task, and subordinates may substitute for or negate the effects of leadership, thus weakening observed relationships between leader behaviors and important organizational outcomes. Substitutes for leadership make leader behaviors such as task-oriented or relationship-oriented unnecessary. Characteristics of the organization that may substitute for leadership include formalization, group cohesiveness, inflexible rules, and organizational rewards not under the control of the leader. Characteristics of the task that may substitute for leadership include routine and repetitive tasks or tasks that are satisfying. Characteristics of subordinates that may substitute for leadership include ability, experience, training, and job-related knowledge. The substitutes for leadership theory has generated a considerable amount of interest because it offers an intuitively appealing explanation for why leader behavior impacts subordinates in some situations but not in others. However, some of its theoretical propositions have not been adequately tested. The theory continues to generate empirical research. This approach to leadership reflects a philosophy that leaders should be servants first. It suggests that leaders must place the needs of subordinates, customers, and the community ahead of their own interests in order to be effective. Characteristics of servant leaders include empathy, stewardship, and commitment to the personal, professional, and spiritual growth of their subordinates. Servant leadership has not been subjected to extensive empirical testing but has generated considerable interest among both leadership scholars and practitioners. Leadership continues to be one of the most written about topics in the social sciences. Although much has been learned about leadership since the 1930s, many avenues of research still remain to be explored as we enter the twenty-first century. Bass, Bernard M., Bruce J. Avolio, Dong I. Jung, and Yair Berso. "Predicting Unit Performance by Assessing Transformational and Transactional Leadership." Journal of Applied Psychology 88 (2003): 207–218. Blank, Warren, John R. Weitzel, and Stephen G. Green. "A Test of the Situational Leadership Theory." Personnel Psychology 43 (1990): 579–597. Fiedler, Fred E. A Theory of Leadership Effectiveness. New York, NY: McGraw-Hill, 1967. Graeff, Claude L. "The Situational Leadership Theory: A Critical View." Academy of Management Review 8 (1983): 285–291. Graen, George, and William Schiemann. "Leader-Member Agreement: A Vertical Dyad Linkage Approach." Journal of Applied Psychology 63 (1978): 206–212. Greenberg, Jerald, and Robert A. Baron. Behavior in Organizations: Understanding and Managing the Human Side of Work. Upper Saddle River, NJ: Prentice-Hall, 2000. House, Robert J. "A Path-Goal Theory of Leader Effectiveness." Administrative Science Quarterly 16 (1971): 321–339. House, Robert J., and Ram N. Aditya. "The Social Scientific Study of Leadership: Quo Vadis?" Journal of Management 23 (1997): 409–473. Kirkpatrick, Shelley A., and Edwin A. Locke. "Leadership: Do Traits Matter?" Academy of Management Executive 5 (1991): 48–60. Kinicki, Angelo, and Robert Kreitner. Organizational Behavior. Boston, MA: McGraw-Hill Irwin, 2006. Luthans, Fred. Organizational Behavior. Boston, MA: McGraw-Hill Irwin, 2005. Podsakoff, Philip M., et al. "Do Substitutes for Leadership Really Substitute for Leadership? An Empirical Examination of Kerr and Jermier's Situational Leadership Model." Organizational Behavior and Human Decision Processes 54 (1993): 1–44. Steers, Richard M., Lyman W. Porter, and Gregory A. Bigley. Motivation and Leadership at Work. New York: McGraw-Hill, 1996. Stogdill, Ralph M. "Personal Factors Associated with Leadership: A Survey of the Literature." Journal of Psychology 25 (1948): 335–71. Stogdill, Ralph M., and Bernard M. Bass. Handbook of Leadership: A Survey of Theory and Research. New York, NY: Free Press, 1974. Vroom, Victor H., and Phillip W. Yetton. Leadership and Decision Making. Pittsburgh, PA: University of Pittsburgh Press, 1973. Wren, Daniel A. The Evolution of Management Thought. New York, NY: Wiley, 1994. Yukl, Gary. Leadership in Organizations. Englewood Cliffs, NJ: Prentice-Hall, 1994. This is, to say the least, a very comprehensive, indepth and painstakingly thorough x-ray of leadership theories in management. It will be greatly appreciated if hierarchical and upper-echelon theories of leadership can also be added to the list as well as population-ecology theory. On the whole, it is excellent analytical work. Kudos.